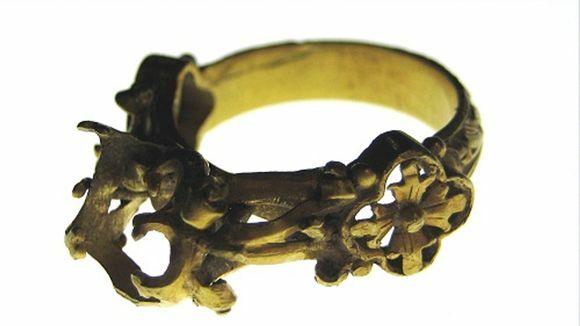 FINLANDE – Espoo - A local resident sweeping a field with a metal detector in Espoo last week discovered an elaborate gold ring dating back to the 1300's. It is a unique find in Finland that hints at how powerful men of the Middle Ages travelled the King's Road. The King's Road was an old royal post route reaching from Bergen, Norway on the Atlantic coast, running to Oslo and Stockholm, to Mariehamn in the Åland Islands, through Finland's south-western archipelago to Turku, across southern Finland, on to Vyborg and St Petersburg, Russia at the eastern end of the Baltic. According to Tryggve Gestrin of the Espoo City Museum, the ring found last week dates to the Middle Ages and is similar to a few rare examples discovered only in Sweden and Norway. "It is a unique find. No ring like this has been found before in Finland. If we compare it to similar finds in the Nordic countries, then it can be dated to the mid-1300's," says Gestrin. ROYAUME UNI – Havant - Buried a few feet under a garden in the centre of Havant, archaeologists stumbled upon a Roman well filled with coins and a bronze ring with a carving of Neptune, the Roman god of the sea. Perhaps most intriguing was the discovery of eight dog skeletons at the bottom of the well. Experts believe the dogs, which were worshipped in some ancient religions, may have been dropped down the ‘sacred well’ as a sacrifice to the gods. The excavation was done at Homewell House, a Georgian property behind St Faith’s Church that is undergoing renovation. Dr Andy Russel, from Southampton Archaeology Unit, told The News: ‘I would say it’s a pretty amazing find. ‘We have done a few sites in Havant before and found Roman bits and pieces but nothing on this scale of a beautifully constructed well with coins, a ring and this strange deposit of dogs in it. ‘I’ve never come across a deposit of dogs down a Roman pit or well before – it’s intriguing.’ The well, dated at between 250 and 280AD, is made of stone from the Isle of Wight. Dr Russel added: ‘We have found post holes where people have put up buildings in the posts. There’s no sign of stone buildings. This is not a Fishbourne Roman Palace. Wooden buildings probably made up the settlement.’ The dogs showed wounds that had healed, indicating they may have been used for dog fighting. 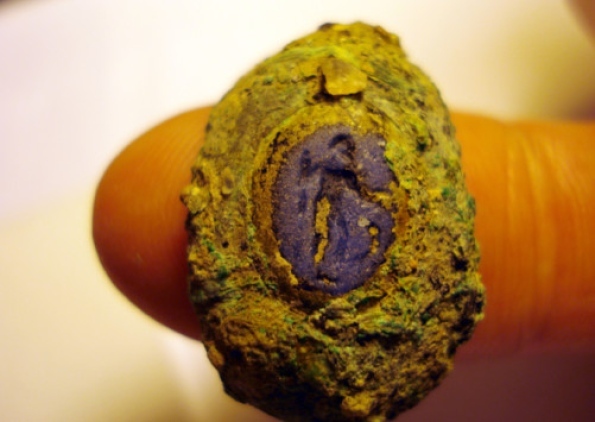 Archaeologists believe the ring may have been dropped down the well by a Roman sailor, perhaps praying for safe passage home on the stormy seas. NEPAL – Kathmandu - Precious gold and silver dating back to the Malla and Rana eras and weighing thousands of kilograms has been found in the Hanumandhoka treasury that was opened by the government around five months ago. A final report on the treasury made public on Friday reveals that the treasure trove in Bhandarkhal on the left of the famous nine-storey temple contained a total of 51.5 kg of raw gold and gold coins, 2,234.5 kg of jewellery and utensils with mixed proportion of gold and silver , over 11,189 kg of raw silver and silver ware and jewels and precious stones weighing over 3.6 kg. Unveiling the report, director general of the Department of Archaeology (DoA) Bhes Narayan Dahal said they also found utensils made of silver and copper and weighing 4,202 kg. Also discovered were over : 2684.6 kg of gold plated copper and bronze items and pure bronze weighing over 3,293 kg. “All the items were packed in 33 wooden boxes and six metal lockers,” Dahal said. A gold en crown with Jita Mitra Malla’s name written on it was also found in one of the treasure boxes. Malla was the king of Bhaktapur between 1673 and 1696 AD. “It is believed that the king used to wear this crown during religious ceremonies,” Dahal said. Archaeologists believe that the treasure trove, which was set up by the last Malla king of Kantipur, Jaya Prakash Malla, was also used by the Shah kings and Rana prime ministers. Dahal said the house was never opened after the then Rana prime minister, Chandra Shumsher, renovated it in 1913. HONGRIE – x Szigetvar - A group of Turkish and Hungarian historians have launched a fresh expedition to find the Otomman Sultan Suleiman the Magnificent’s heart and inner organs, believed to be buried in a shrine on the top of a hill near Szigetvar, Hungary, after he died during the famous siege of the town’s fortress in 1566. Most historians assume that the shrine, destroyed by Austro-Hungarians some 123 years after it was built, was located under the Szuz Maria (Saint Marie) Church. However, experts leading the excavations told daily Hürriyet that no traces of the shrine have been found under the grounds of the Church. “We are now certain that the shrine is not located here [in the Church]. Now we will scan the scores of documentation on the issue, obtain the required permits and excavate nearby the vineyard houses,” Hungarian team leader Erica Hancz told Hürriyet, noting that 2016 would be the 450th anniversary of Suleiman's death. TURQUIE – Istanbul - The Ottoman gravestones that were brought back to Turkey after their auction sale in Britain was stopped thanks to the efforts of Turkish Ministry of Culture and Tourism are being exhibited now in Istanbul Archaeology Museums Directorate. The gravestones, which are thought to be stolen from Istanbul, are on display in Istanbul Archaeology Museums Directorate for a week as of Sunday. Istanbul Turkish and Islamic Arts Museum will take the gravestones, dating back to the 17th and 18th centuries as experts say, under its protection. GRECE – Dikili Tash - In the prehistoric settlement of Dikili Tash were discovered the oldest samples of wine that were ever recorded in Europe. The samples date back to 4200 BC and reverse existing data regarding the way of living during the Neolithic period. The prehistoric site of Dikili Tash is located south east of Drama in Eastern Macedonia, Greece. It lies approximately 2 km from the ruins of the ancient city of Philippi and within the limits of the modern town of Krinides (Municipality of Kavala). 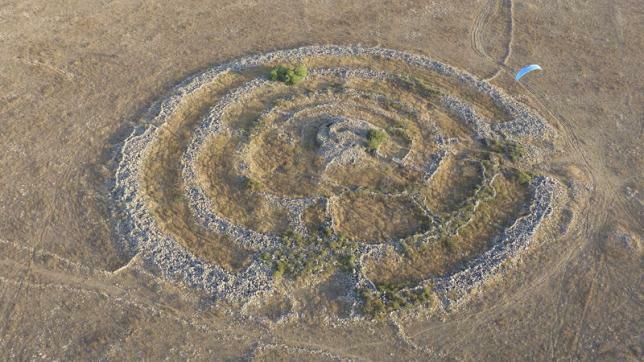 “It is an impressive and important discovery,” the archaeologist of the 17th Ephorate of Prehistoric and Classical Antiquities and co-director of the excavations at Dikili Tash Dimitra Malamidou told dimokratianews.gr. She explained that, “During the excavations that took place in a house on the archaeological site, called House 1, quantities of carbonized grape berries that had been pressed were discovered in pots, a fact which proves the extraction of juice from grapes.” “So far, we knew that people drank wine in the Bronze Age (from the 12th century B.C. henceforth), but now we learn that the wine-making process was known long before that Age, since 4200 BC,” Malamidou stated. Based on the new findings occur new data regarding the consumption of wine, as well as the social groups of the Neolithic period. ROYAUME UNI – St Martin - Islands perhaps better known for their Bronze Age relics are revealing traces of an earlier civilisation. A settlement being unearthed on St Martin's represents "the most promising neolithic site in Scilly", according to Dr Duncan Garrow of Liverpool University, a specialist in the prehistory of North- West Europe. Along with maritime archaeologist Dr Fraser Sturt of Southampton University and a ten-strong team, supplemented by locals, he is exploring how Neolithic man arrived on the islands some 5,000 to 6,000 years ago. After identifying a possible Mesolithic or Neolithic occupation site at St Martin's Old Quay last year, based on finds of pottery and flint tools, Dr Garrow is now conducting a dig in the area, and called it the most promising site in Scilly. It is part of a Stepping Stones project investigating a northward migration from Europe via seaways and islands in which nomadic hunter-gatherers became settled farmers.